In the history of fashion, has there ever been a better combination than Diamonds and Yellow Gold? 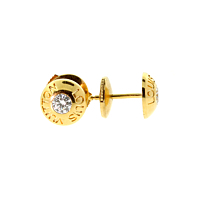 These elegant Earrings from Louis Vuitton prove yet again that this timeless pairing never fails, with the splendid 18k Yellow Gold accenting the inset Vvs1 E Color Diamonds perfectly. The brilliant design is completed with an iconic Louis Vuitton motif that surrounds the central Diamonds.